Dickson Tong (pictured) was just five when he found himself stuck in a lift with his mother. No lights, ventilation or a smartphone to call for help, it was one of the most uncomfortable experiences would eventually leave a lasting impression on the young boy. 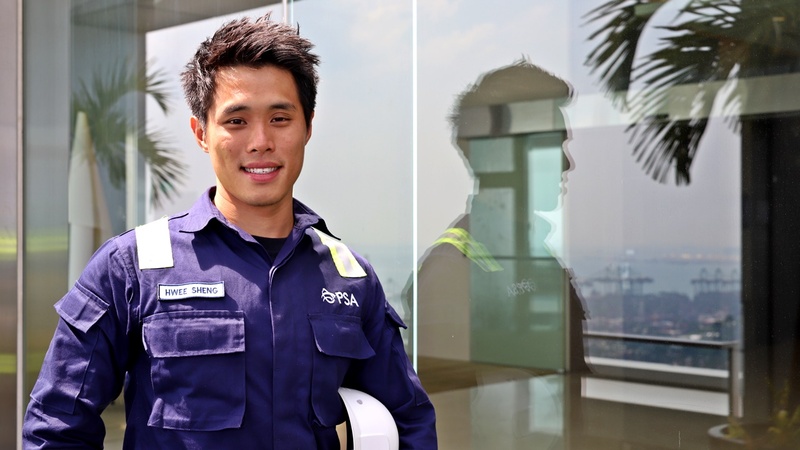 “I regarded the two lift technicians who rescued us as heroes. This triggered me to want to work with lifts as a career because I was curious to see how they worked. I was also afraid of heights and I wanted to conquer that directly through the job. 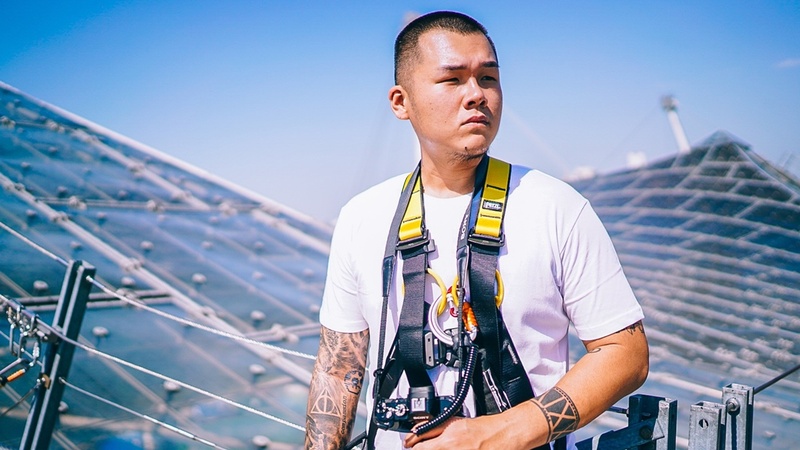 This was one of the reasons that made me want to join the industry when I finished my National Service,” said Dickson, who is now a senior lift technician with Hitachi Elevator Asia. A typical day on the job for Dickson sees him working with lifts of different shapes and sizes. They can range from small single domestic lifts in an old building to the large, fully computerised commercial lifts in new office buildings. What’s constant on the job is the fact that Dickson and his team are responsible for ensuring that the lifts are working optimally. 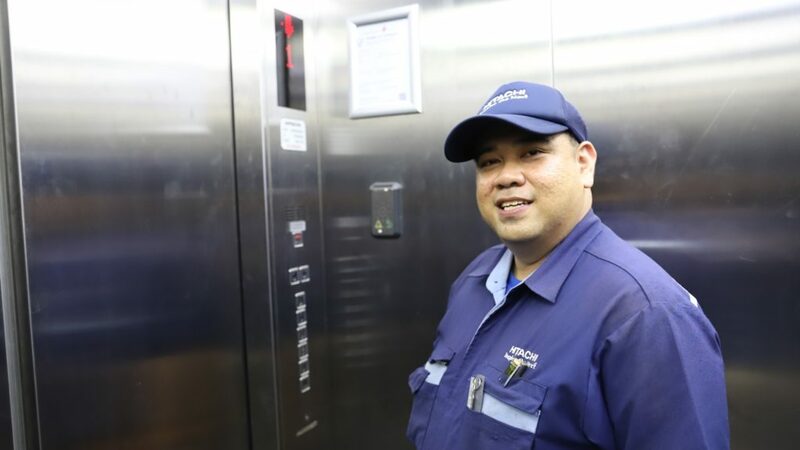 “Often, the job also involves meeting up with our customers to understand if they may have any particular issues with the lifts. Otherwise, the bulk of the job will be centered on spotting for wear and tear, servicing the moving parts, noting areas which we would need to recommend for repair or replacement,” shared the Metal Industries Workers’ Union leader. In the 18 years that Dickson has been on the job with Hitachi, he’s witnessed how technology has made its way into the lifts. “The older lifts we work with do not have computers in them and there are a lot of mechanic parts that we will need to service. These days, a lot of components are taken over by micro-computers which reduce the manual scope of the work, allowing us to focus our efforts on the problem areas. This has helped us increase our productivity. “As the analogue systems in the lifts change to include more digital systems, our job has evolved to include running diagnostics by connecting a computer to the lifts. The data helps us understand how the lifts have been operating and ‘talks’ us through what specifically needs to be done for maintenance. We also now have to read computer language, such as binary to decimal conversions because the computers in the lifts now take over the control of the mechanical functions,” said Dickson. With the guidance of mentors and seniors in the company, Dickson was able to pick up the necessary skills and tricks of the trade in his early days. But as the lifts got increasingly high-tech, Dickson’s company began developing courses and training modules to equip its technicians with the necessary skills to work with the computers used in running the diagnostics software in the lifts. “In the lift industry, what’s important is having a learning attitude because we need to keep up with the times or risk being left out,” says Dickson (Photo credit: Jonathan Tan). “It was not easy for some of my colleagues to deal with the conversion as they were too used to the old system. But it’s all about changing the mindset and the company was able to get everyone on board with the changes. In the lift industry, what’s important is having a learning attitude because we need to keep up with the times or risk being left out. As and when there are new developments in the lifts, our company also organises training to help us adapt to the changes,” he said. When asked about the skills that would help a lift technician prepare for the future, Dickson said that IT skills and an understanding of different types of computer software will be useful. “As technology develops, sensors may even be used to capture real time data on the lifts and feed it back to a control centre. We need to be familiar with computers and the programmes that can help us make sense of such data. Besides that, social and communication skills are also very useful in helping us better understand our customers and help them resolve issues on the ground,” he added. The role of a lift technician requires specialised skills to undertake the critical task of repairing lifts. The job can get greasy and involve working in tight spaces, but it is not as dangerous as what movies make lifts out to be. “There are actually a lot more safety features that prevent any of that from happening. But we have to approach the work with safety in mind, such as switching off the power supply before changing parts,” he explained. With the recent acceptance of recommendations by the Lift and Escalator Sectoral Tripartite Committee by the Government, Dickson hopes that the progressive wage model will be able to attract new talent to bolster the ranks in the industry.